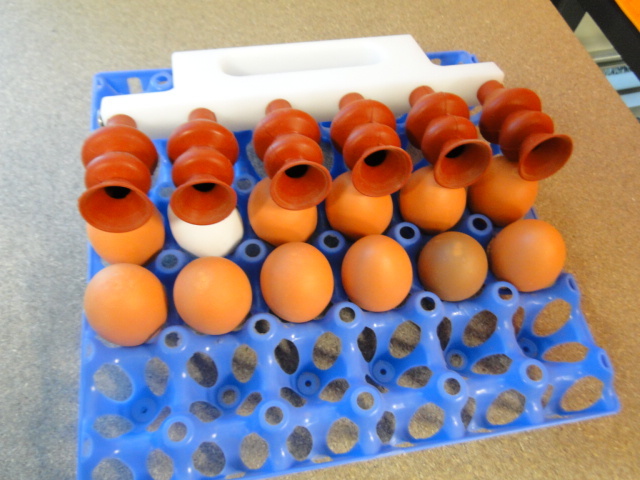 Egg handling includes products that handle or transport eggs safely and efficiently. This equipment may take the form of egg trays, crates for multiple stacked egg trays, egg tray pallets and vacuum or manual egg lifters. 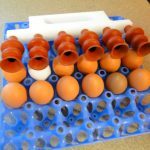 Basically, egg handling covers moving eggs from one spot to another as part of your daily processes. Egg handling systems and equipment allow safe collection of eggs directly onto plastic egg handling trays for easy transport back to the grading room. Eggscargo pallets, the Lindamatic crate, Egg Crates and compatible, coloured egg trays are examples of successive egg handling from egg collection, grading, packing and transport. The contents of an egg are neatly packaged by the chook in a shell made of calcium carbonate. A thin coating of protein (known as the cuticle) covers the shell. This natural package is a defense system and the shape of the egg is surprisingly a solid structure. Your egg handling and transport system must complement the size, structure and storage capabilities of your daily egg capacity. Manual egg lifters are an economic alternative to the motorised, original Peeco egg lifter. Manual egg lifters use the vacuum created by your thumb covering a hole, once the eggs are in place, to hold the eggs. Release your thumb from hole when eggs are ready for release.